I want to delay Startup Programs & Control the order of Startup Programs in Windows. Are all those startup programs necessary? When I load Windows, I feel it takes the eternity before I can actually get to open any program. The reason is of course the n number of startup programs that Windows tries to load before presenting you with a usable desktop. You can check out startup programs by typing msconfig in the Run dialog box (WinKey + R). And often, you would notice programs that you don't really need: Google Updater, igfxtray, hotkeycmd and all those unwanted processes. In my case, I remove most of the unwanted programs. Just to make sure that removing a program will not affect your operating system, copy the process name and google it. If it says the program is essential for functioning of Windows, keep it else remove it using MSCONFIG. Better still, use WinPatrol from winpatrol.com. It lets you check for a processes by right clicking on it. The free version is enough to maintain your startup programs. It also allows for delaying programs without having to edit the Windows registry. Right click on a process and select move to delayed programs. In the delayed programs tab, click on delay options and select the time by which you wish to delay the startup item. It is that simple. Normally, all the updaters go to the delayed programs list in my case: Javaupdate, Java scheduler; dotnet update; google update (better remove this one completely). I also delay the Synaptics Touchpad and Touchpad helper. Before I actually feel the need to use scroll/edgemotion etc features, I can still use the touchpad to open programs so why load it with the OS? This is because the touchpad will function as a PS2 mouse until Synaptics enhanced features load. Let me know what you do to speed up Windows load time. WinPatrol is great, but do remember that it has be set to start with Windows, for the startup delays to work. If you just move some startups to the Delayed List and exit WinPatrol and NOT set it to run at boot-time, it wont do. You can delay Services starting up too via Services.msc. Use the Automatic (Delayed Start) option. Having a batch file placed in the startup folders with the delay parameters is another option. Apart from WinPatrol, there are 3 other freeware I know of, that can help delaying startups. Read Set Delay time for Startup programs in Windows 8 / 7. Startup Delayer Standard Edition : Startup Delayer gives you the power to optimize your Startup Process by delaying applications from starting up as soon as you log into your computer. By delaying the applications during start up, your computer becomes usable a lot faster. 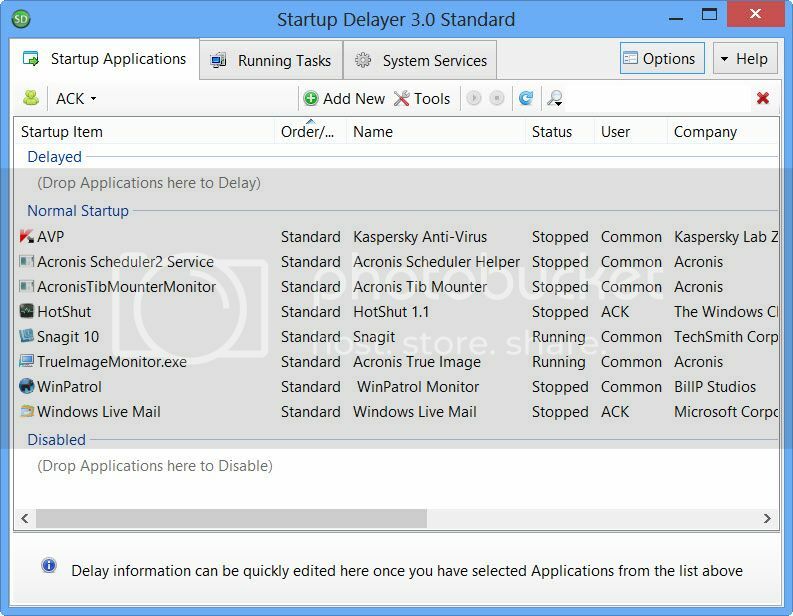 Startup Delayer will then start launching your delayed applications when your computer is more idle. LaunchLater: LaunchLater allows you to defer the launch of applications that run at Windows login. This lets Windows focus on booting itself first, then subsequently running a list of configured startup apps using a schedule that you control. Startup Helper lets you choose the order in which start up programs should load. WinPatrol is great, but do remember that it has be set to start with Windows, for the startup delays to work. If you just move some startups to the Delayed List and exit WinPatril and NOT set it to run at boot-time, it wont do. True that. Winpatrol has to be a startup item. Also, I find that moving certain items like Scrybe etc to delayed startup creates problems. They wont load sometimes. I tried this. It is a good option but does not allow setting up delay time. This is a useful information. I am downloading it. And to use it in conjunction with WinPatrol, I guess I can add WinPatrol to the delayed start in Startup Delayer Standard? That will allow me to use the protection provided by WinPatrol? Or will they conflict. Anyway, will check it out and let you know if any conflicts arise. Last edited by Arun Kumar; 2nd September 2012 at 08:48. Why delay them - just disable every startup except those that you started yourself (e.g. sidebar or a dock) and the AV program. Slow access to the computer is not the only problem, also remember that all those "updaters" take system resources. Personally i never let any program install any "updaters" / "services". I run all updates manually. True that. Winpatrol has to be a startup item. Thanks to everyone for the kind words for WinPatrol. Since I use it myself it's critical for me to keep WinPatrol small and non-intrusive. Ironically, one of the last programs I did for Gateway started at boot time and checked the date you started to use your computer and just before any warranty expired it would let you know and provided a button connecting you to the store to order an extended warranty. While the program is typical of what WinPatrol warns you about I made sure that once it checked for the date it exited completely. As many know, I'm not a fan of auto-update programs but if I would hope that any program designed to check for new versions would do the same. Check for a new version and then exit. Unfortunately, I don't see this happening with the exception of update programs that are scheduled tasks. Glad you mentioned the Automatic (Delayed Start) for Services. Not many know about this. There's also a new type called Triggered Start that will tell a Service to start when a certain event occurs. I suspect other delay startup programs will run into the same problem that was mentioned with Skype. Some Services expect a program to be running when they start. Skype has a Service called Skype Updater which checks to make sure Skype is still in the Startup list. ^ To delay startups, you may need a 3rd-party freeware. Glad to see you here. Winpatrol is one of the best things that ever happened to me. I don't even remember how long I've been using it. I turned off Windows UAC and rely on WinPatrol for change alerts!!! I shared it in a post on The Windows Club as well as on Bright Hub Media. Regarding auto-update programs, I've been able to successfully disable Java Scheduler and other similar programs using WinPatrol. Google Updater was a problem so I simply removed it using the option to delete program after reboot. That fixed it. Some programs do give a problem when sent to Delayed Start but looking at the larger canvass, it helps to fine tune start-up. This one feature is exceptionally good. I can actually set up wait time before they launch. No issues there as well. I bet I can safely say it is a must have software for anyone needing better control over their computer. Thank you for giving me WinPatrol.